If you saw my post in the Wanted folder looking for Jade Green Milk, you know I have four examples and am looking for more. I created this list several years ago, so the prices are out of date. 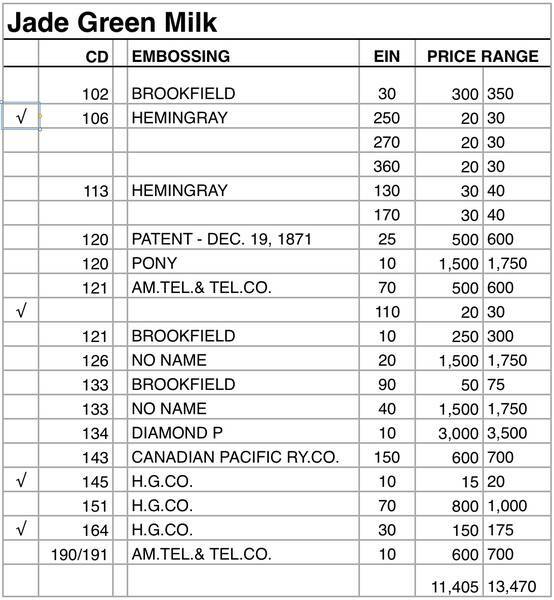 It identifies the insulators that are listed as available in Jade Green Milk. I don't remember anymore how I generated the list. I can't believe I would've looked through the whole price guide line for line! Maybe I had a way of doing a search? I'm guessing that the color looks a little different between the various manufacturers, but I don't know what they're like because I've only seen the ones I have (and pictures of the 113). I'm guessing that the DIAMOND P looks a little different than the H.G.CO. Anyway, for anyone interested, there you have it.